This Brit Guys called Keith martin will soon hold a new world record without even getting out of bed. This guy currently weighs 812 Pound. 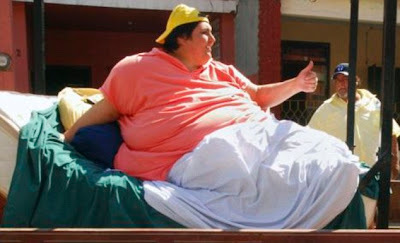 Due to his weight this guy was believed as the world's fattest man alive today. even though the excess weight has kept him from living a normal life. Keith Martin is 42-year-old from Harlesden, North West London, He is bedridden and requires 18 caretakers to help keep him alive, Even though he'd probably prefer to be able to get out of bed. 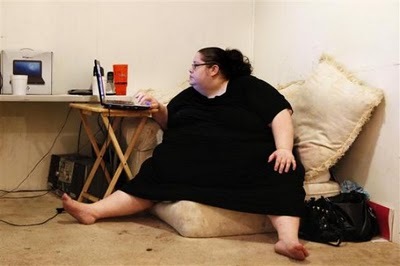 He spends most of his days watching TV and eating, adding even more pounds to his 5-foot, 9-inch frame. Keith martin weight surpass the previous records holder such as Pauline Potter, a 47-year-old, 643-pound Californian, has earned a spot in the 2012 Guinness World Records 2012 record book as the World's Heaviest Woman, Susanne Eman a big model with 728 Pounds weight and also Donna simpson a woman who want to be the heaviest woman in the world. Check out Donna Simpson Daily Pictures here. Read also the List of The Heaviest people in History. 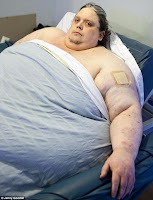 Many people believe that Keith is currently the World's Fattest man with 58stone even though Guinness World Records currently recognizes Manuel Uribe of Mexico as the record holder who used to be 90st but has slimmed to 31st 6lb. Here's some photos of the World's Fattest People including Donna Simpson, Susanne Eman, Pauline Potter and the newest fattest man in the world Keith Martin.